The FIAT 500 is an iconic vehicle with an unmistakable design that is eye-catching and charming. The 2017 FIAT 500 model will offer more of what customers have come to love about the Italian coupe, including the ability to personalize to every driver's personal taste and style. The 500 has limited competition on the market, and with its engaging powertrain and completely original design, the 2017 FIAT 500 is truly one of a kind. The 2017 model has received some notable changes, including a simplified lineup of trims comprised of the Pop, Lounge, and Abarth. Another change comes to the Abarth, as this driver-oriented model has gained rear-park assist. The 2017 FIAT 500 has a design that lends itself well to driving a variety of environments, whether that means city, highway, or country road. The exceptional powertrain optimizes the fun of the drive while also maximizing fuel economy, allowing you to enjoy the exhilarating drive without worrying about a large gas bill. The 2017 FIAT 500 will come standard with a 1.4-liter four-cylinder engine, and it is linked to a front-wheel drive system and a six-speed automatic transmission. This configuration produces 101 horsepower and 98 lb-ft of torque, along with a fantastic combined city/highway fuel economy of 35 mpg. The Abarth trim is powered by a 1.4-liter turbocharged engine, and it can be linked to a five-speed manual or six-speed automatic transmission. The standard 500 Abarth configuration will feature the automatic transmission, and produce 157 horsepower and 183 lb-ft of torque. 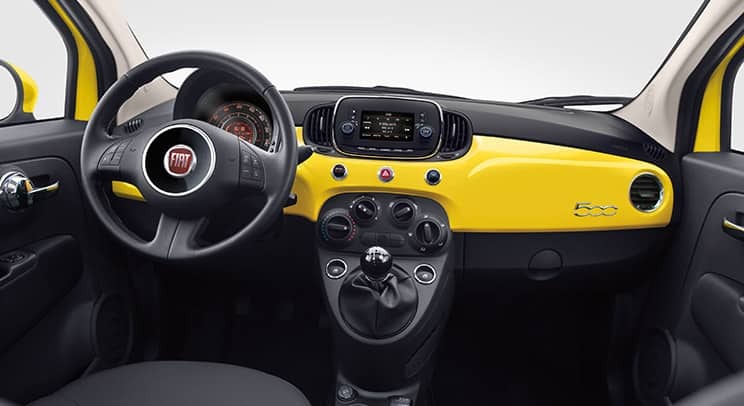 When equipped with the optional manual transmission, the 500 Abarth will deliver 160 horsepower and 170 lb-ft of torque. The 2017 FIAT 500 has arrived to the new model year with its familiar two-door hatchback body style, seating for four, and availability in three trims - the Pop, Lounge, and Abarth. Each of these trims is offered with the Cabrio's convertible body style. Every 500 is impressively equipped with a wide range of features, and the unique design can be enhanced in many ways with optional accessories. Coming standard with the base Pop trim are highlights like 15-inch alloy wheels and the convenience of keyless locking and unlocking. The interior is comfortable with great cloth upholstery, and the 50/50-split folding rear seatbacks will make it easy to configure the interior space for cargo. Drivers will love the 7-inch color information display, as well as the innovative 5-inch Uconnect touchscreen. A six-speaker audio system from Alpine is standard, and it is featured with an auxiliary audio input, voice controls, Bluetooth (for phone and audio), and two USB ports. Some of the optional accessories with the Pop include a Beats audio sound system, a sunroof (for coupe models), a navigation system, and unique styling enhancements. How many trim levels is the 500 offered in for 2017? For 2017 FIAT has simplified their 500 trim availability, as it is now comprised of three optional trims. However, FIAT still offers an incredible range of standalone accessories and packages for a personalized experience. Is the 500 in stock at Reedman-Toll Chrysler Dodge Jeep FIAT? 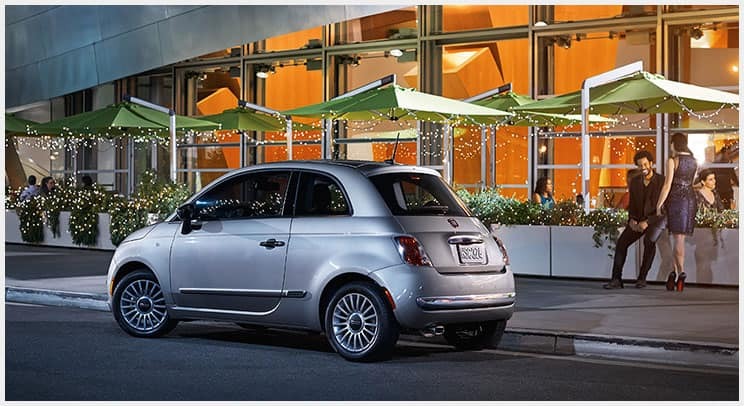 Yes, we have a great range of 500 models available, and they can be found in our New FIAT Inventory! Which trim levels are offered in the convertible style? 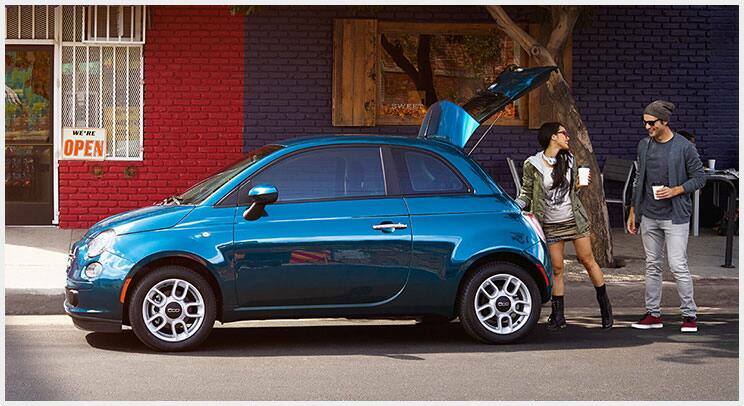 The 500 Cabrio, which the brand's convertible model, is available as an optional body style on every 500 trim. The 2017 FIAT 500 is a small vehicle that has been constructed with a devotion to protecting every passenger. It has performed great in tests conducted by the Insurance Institute for Highway Safety, and it comes equipped with antilock disc brakes, stability and traction control, hill start assist, and more. Rear parking sensors are found as a standard feature on most of the models, with the exception of the base Pop hatchback model. If you have questions about the exciting new 2017 FIAT 500 give us a call today at Reedman-Toll Chrysler Dodge Jeep RAM FIAT!